Two major types of osmoregulation are osmoconformers and osmoregulators. Osmoconformers match their body osmolarity to their environment actively or passively. Most marine invertebrates are osmoconformers, although their ionic composition may be different from that of seawater. Osmoregulators tightly regulate their body osmolarity, maintaining constant internal conditions. They are more common in the animal kingdom. Osmoregulators actively control salt concentrations despite the salt concentrations in the environment. An example is freshwater fish. The gills actively uptake salt from the environment by the use of mitochondria-rich cells. Water will diffuse into the fish, so it excretes a very hypotonic (dilute) urine to expel all the excess water. A marine fish has an internal osmotic concentration lower than that of the surrounding seawater, so it tends to lose water and gain salt. It actively excretes salt out from the gills. Most fish are stenohaline, which means they are restricted to either salt or fresh water and cannot survive in water with a different salt concentration than they are adapted to. However, some fish show a tremendous ability to effectively osmoregulate across a broad range of salinities; fish with this ability are known as euryhaline species, e.g., Flounder. Flounder have been observed to inhabit two utterly disparate environments—marine and fresh water—and it is inherent to adapt to both by bringing in behavioral and physiological modifications. 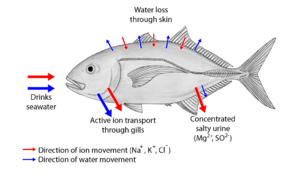 Some marine fish, like sharks, have adopted a different, efficient mechanism to conserve water, i.e., osmoregulation. They retain urea in their blood in relatively higher concentration. Urea damages living tissues so, to cope with this problem, some fish retain trimethylamine oxide. This provides a better solution to urea's toxicity. Sharks, having slightly higher solute concentration (i.e., above 1000 mOsm which is sea solute concentration), do not drink water like fresh water fish. While there are no specific osmoregulatory organs in higher plants, the stomata are important in regulating water loss through evapotranspiration, and on the cellular level the vacuole is crucial in regulating the concentration of solutes in the cytoplasm. Strong winds, low humidity and high temperatures all increase evapotranspiration from leaves. Abscisic acid is an important hormone in helping plants to conserve water—it causes stomata to close and stimulates root growth so that more water can be absorbed. Plants share with animals the problems of obtaining water but, unlike in animals, the loss of water in plants is crucial to create a driving force to move nutrients from the soil to tissues. Certain plants have evolved methods of water conservation. Xerophytes are plants that can survive in dry habitats, such as deserts, and are able to withstand prolonged periods of water shortage. Succulent plants such as the cacti store water in the vacuoles of large parenchyma tissues. Other plants have leaf modifications to reduce water loss, such as needle-shaped leaves, sunken stomata, and thick, waxy cuticles as in the pine. The sand-dune marram grass has rolled leaves with stomata on the inner surface. Hydrophytes are plants in water habitats. They mostly grow in water or in wet or damp places. In these plants the water absorption occur through the whole surface of the plant, e.g., the water lily. Halophytes are plants living in marshy areas (close to sea). They have to absorb water from such a soil which has higher salt concentration and therefore lower water potential(higher osmotic pressure). Halophytes cope with this situation by activating salts in their roots. As a consequence, the cells of the roots develop lower water potential which brings in water by osmosis. The excess salt can be stored in cells or excreted out from salt glands on leaves. The salt thus secreted by some species help them to trap water vapours from the air, which is absorbed in liquid by leaf cells. Therefore, this is another way of obtaining additional water from air, e.g., glasswort and cord-grass. Mesophytes are plants living in lands of temperate zone, which grow in well-watered soil. They can easily compensate the water lost by transpiration through absorbing water from the soil. To prevent excessive transpiration they have developed a waterproof external covering called cuticle. Kidneys play a very large role in human osmoregulation by regulating the amount of water reabsorbed from glomerular filtrate in kidney tubules, which is controlled by hormones such as antidiuretic hormone (ADH), aldosterone, and angiotensin II. For example, a decrease in water potential is detected by osmoreceptors in the hypothalamus, which stimulates ADH release from the pituitary gland to increase the permeability of the walls of the collecting ducts in the kidneys. Therefore, a large proportion of water is reabsorbed from fluid in the kidneys to prevent too much water from being excreted. 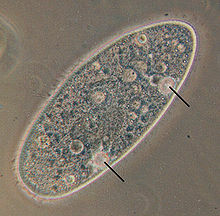 Protist Paramecium aurelia with contractile vacuoles. Amoeba makes use of contractile vacuoles to collect excretory wastes, such as ammonia, from the intracellular fluid by diffusion and active transport. As osmotic action pushes water from the environment into the cytoplasm, the vacuole moves to the surface and disposes the contents into the environment. Bacteria respond to osmotic stress by rapidly accumulating electrolytes or small organic solutes via transporters whose activities are stimulated by increases in osmolarity. The bacteria may also turn on genes encoding transporters of osmolytes and enzymes that synthesize osmoprotectants. The EnvZ/OmpR two-component system, which regulates the expression of porins, is well characterized in the model organism E. coli. Ammonia is a toxic by-product of protein metabolism and is generally converted to less toxic substances after it is produced then excreted; mammals convert ammonia to urea, whereas birds and reptiles form uric acid to be excreted with other wastes via their cloacas. filtration – fluid portion of blood (plasma) is filtered from a nephron (functional unit of vertebrate kidney) structure known as the glomerulus into Bowman's capsule or glomerular capsule (in the kidney's cortex) and flows down the proximal convoluted tubule to a "u-turn" called the Loop of Henle (loop of the nephron) in the medulla portion of the kidney. reabsorption – most of the viscous glomerular filtrate is returned to blood vessels that surround the convoluted tubules. secretion – the remaining fluid becomes urine, which travels down collecting ducts to the medullary region of the kidney. excretion – the urine (in mammals) is stored in the urinary bladder and exits via the urethra; in other vertebrates, the urine mixes with other wastes in the cloaca before leaving the body (frogs also have a urinary bladder). ^ Wood, Janet M. (2011). "Bacterial Osmoregulation: A Paradigm for the Study of Cellular Homeostasis". Annual Review of Microbiology. 65 (1): 215–238. doi:10.1146/annurev-micro-090110-102815. ISSN 0066-4227. PMID 21663439. ^ Cai, SJ; Inouye, M (5 July 2002). "EnvZ-OmpR interaction and osmoregulation in Escherichia coli". The Journal of Biological Chemistry. 277 (27): 24155–61. doi:10.1074/jbc.m110715200. PMID 11973328.